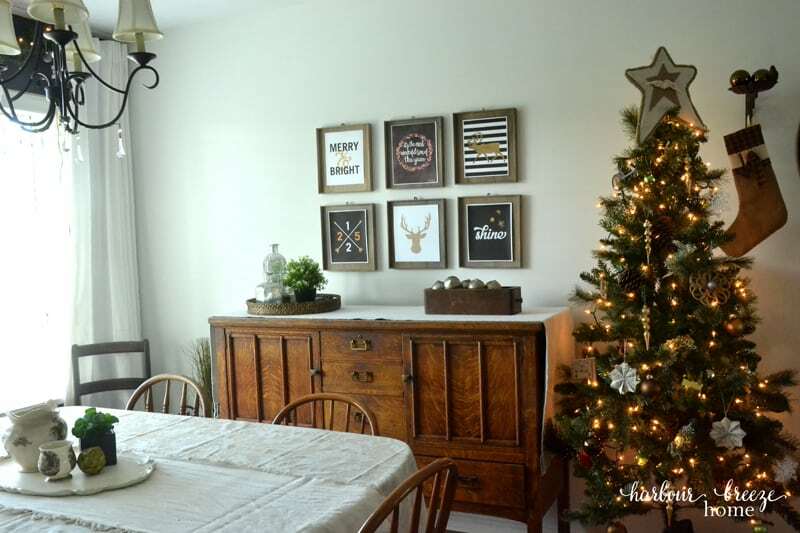 As I was finishing up the One Room Challenge Living & Dining Room, my mind was already busy with the upcoming Christmas season. 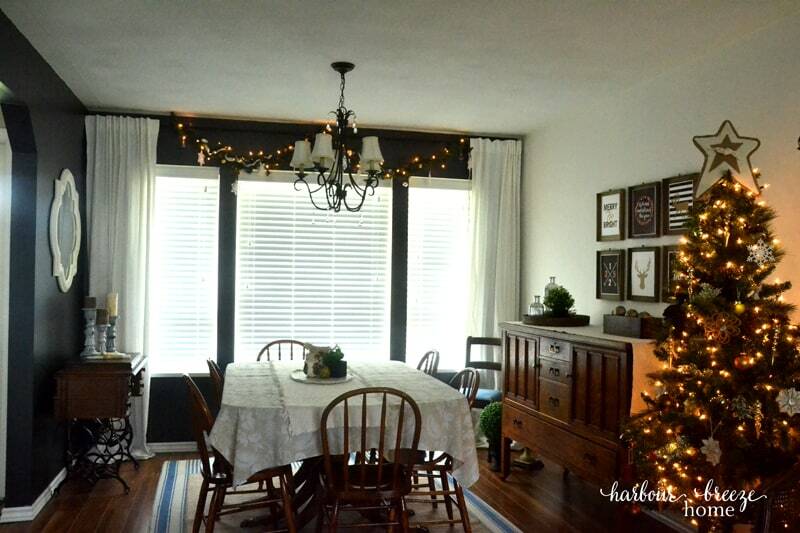 I wanted to carry the same Modern Industrial Farmhouse feel into my Christmas decor, too. In fact, I even contemplated going out and buying all new decor. The good thing about contemplating is that it doesn’t cost a dime! 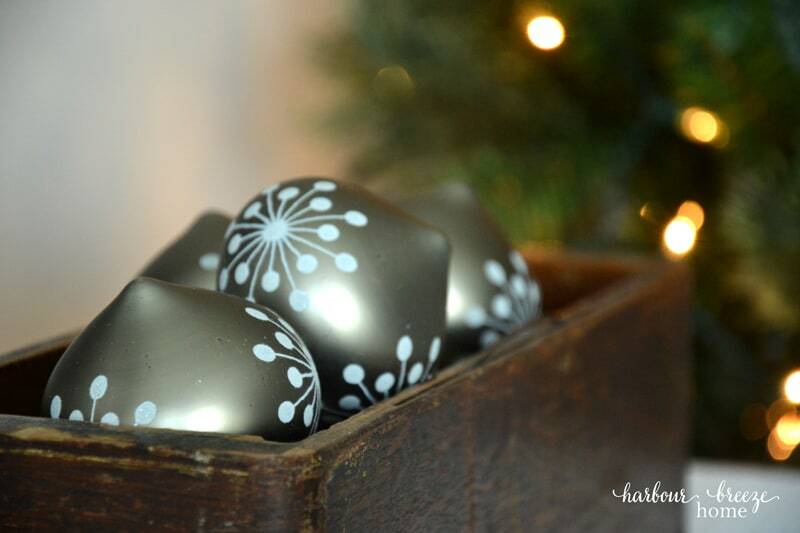 ;) I marched myself on a dark, rainy night to a local Christmas event with decor gallore. I loved so much! ~ And left with nothing. Rather than starting all over and investing a lot of money on full price items, I decided to go home and work as creatively as I could with things I already had. The Dining Room was the starting place. 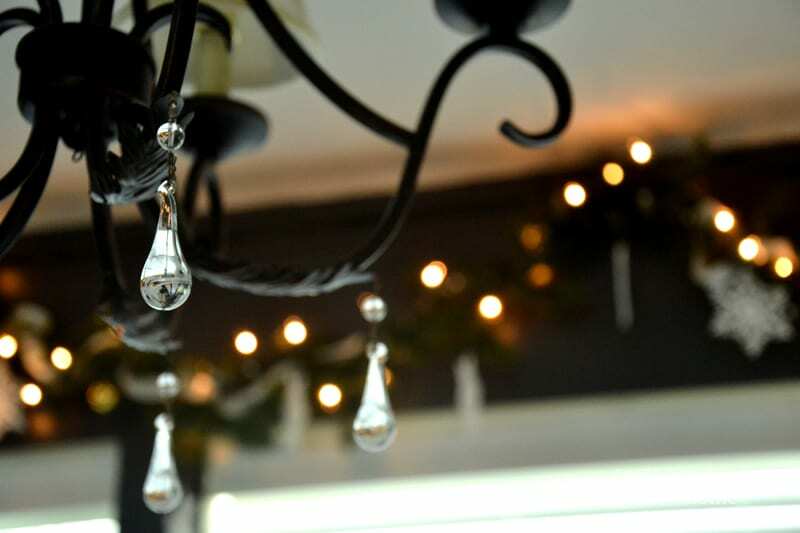 These dark rainy days and nights on the Wet West Coast have made me crave a little twinkle light. 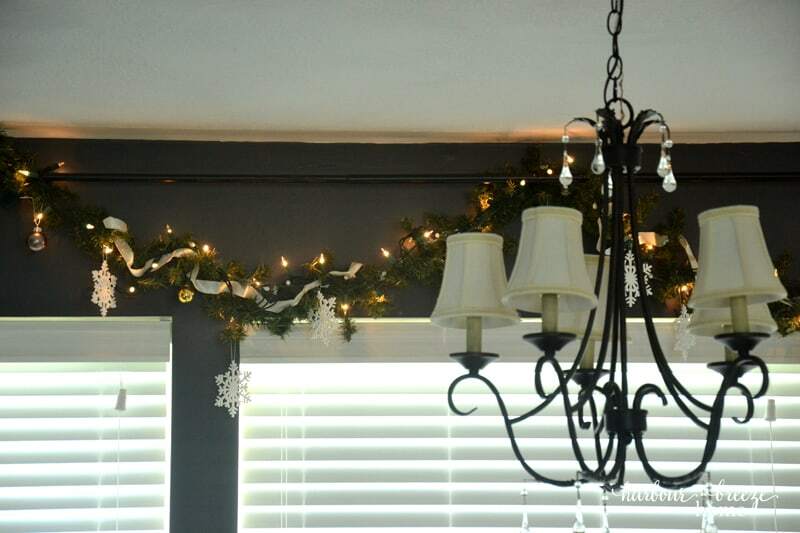 So, up on the curtain rod went a garland with white snowflakes, ribbon, and gold and silver Christmas ornaments. 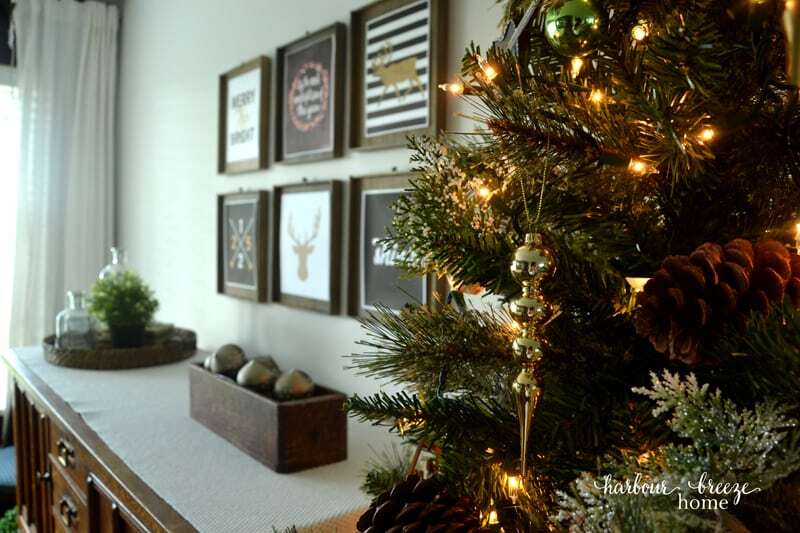 The white and twinkle lights stand out so nice against the Iron Mountain wall color. We loved how easy it was to set up and nestled it beside the buffet. The flour sack and burlap tree topper star perches on the top, and we added gold & bronzey ornaments with a few diy paper star ornaments and pinecones tucked in. I alsostuck in a few snowcovered greenery picks here and there to give it a little more interest and fullness. Although I still love my botanical prints, I switched them out for some Christmas printables I found here, here, and here. 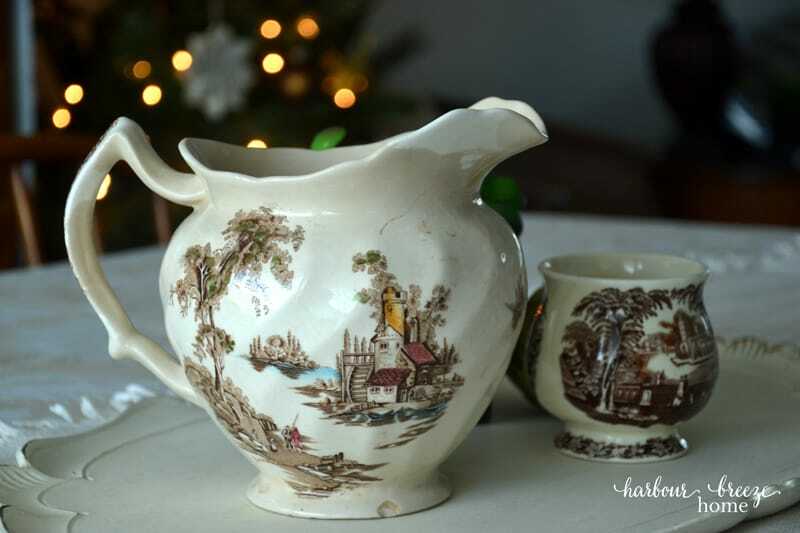 The table centerpiece is an antique pitcher and sugar bowl that is ready & waiting for fresh flowers when it’s time to host a Christmas event. 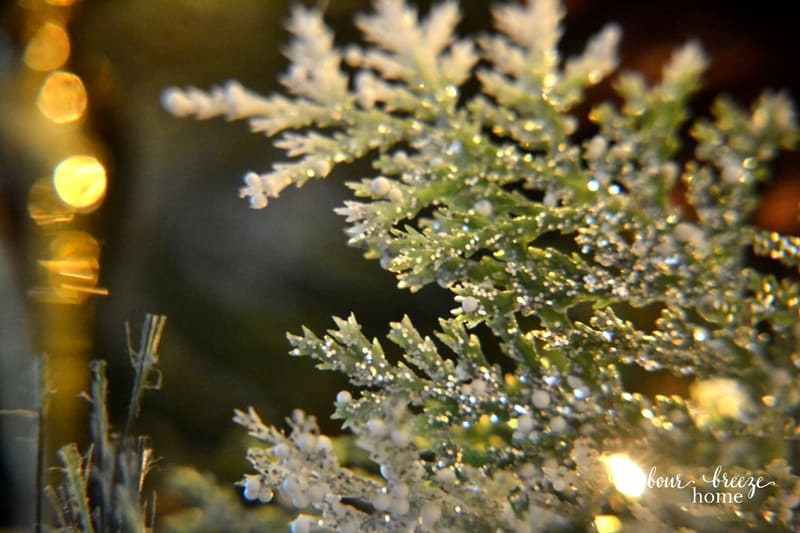 An old sewing machine drawer sits on the buffet top holding some sparkly silver ornaments. We’re enjoying hosting a weekly group into our home from our church (there’s 12 of us), and we’re also looking forward to hosting a few Christmas events here, too. 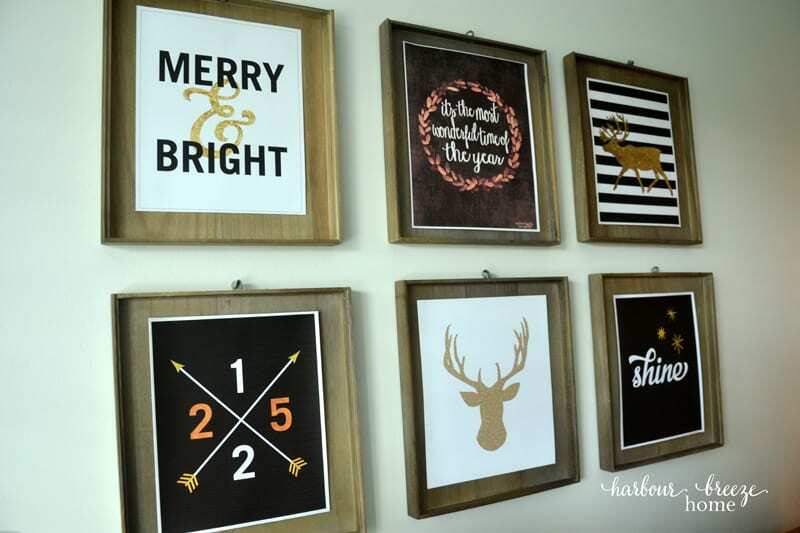 So, these simple decorations add a little holiday feel to the space without taking up valuable space for the guests we’re looking forward to having. 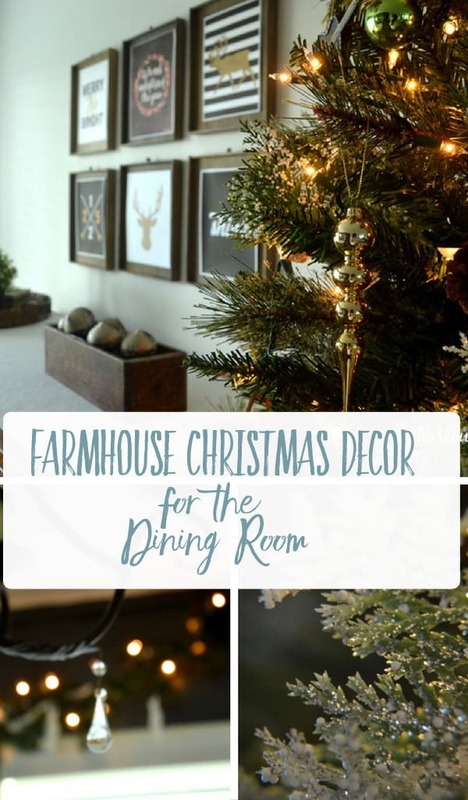 That’s my sweet and simple Christmasy Farmhouse decor for the Dining Room this year. And, as it is Thanksgiving day in the States, I want to take this time to THANK YOU for stopping in and reading this little blog of mine. Thank you for your encouraging words, and for joining me on this journey of finding beauty in the every day things of life. Rita, your Christmas decorations are lovely. Thank you for sharing with us. Simply beautiful! So happy for you and your family to enjoy the holidays in “your own” home.